Hey you what's up? I hope this message will find you well and in good mood as mine! Today I have a very interesting lesson for you and this is about the endgame. So without further ado please click here and study the lesson. The Grand Chess Tour 2018 starts in Leuven, Belgium, with a combined rapid chess and blitz tournament. Ten world-elite players competed over five days; they won very juice money prices and they give us a unique and an entertaining spectacle. The World Chess Champion GM Magnus Carlsem won the tournament Grand Chess Tournament for 2017 but he did not return to defend his title, so we'll going to see a new winner for this year! 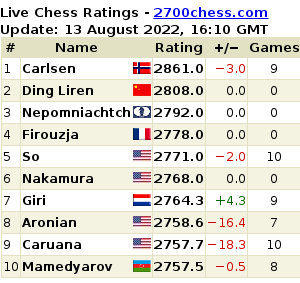 Anish Giri, Hikaru Nakamura, Maxime Vachier-Lagrave, Alexander Grischuk, Fabiano Caruana, Viswanathan Anand, Shakriyar Mamedyarov, Levon Aronian, Wesley So and Sergey Karjakin were the main competitors. They crossed their swords in the chess board for the prize fund of $ 150,000, however So manages to break down the other players defenses, he was the solid winner of the $37,500; and defiantly prove that he is a 2800 player. We will going to examine one of these games. In the diagram below you can say very interesting position and I'd like to ask what your opinion is. Who stands better here? I hope you liked this lesson and if the answer is yes, then please share it with your friends and leave a comment behind. You can read more info for the Grand Chess Tour on the official website, click here.